It’s time to celebrate the love you have for your cat and make sure he or she is healthy, happy and safe. Let February be a reminder to you to make that vet appointment and have your pet checked out. And since February is also National Pet Dental Health Month, have the vet check out your pets teeth too. Take your vets advice. Let them teach you how to take care of all your cats and kitten the correct way from home. 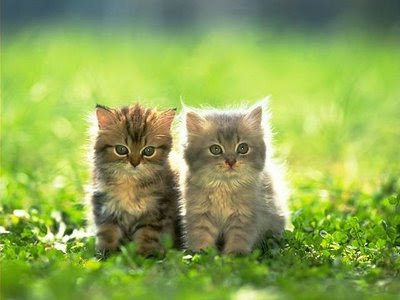 We all want our cats happy, healthy and safe so we can enjoy them as a member of our family for many years. And even when our beloved pet becomes sick we all should know how to make the quality of life for our pets the very best. Americans have a love affair with cats. According to the newly published American Veterinary Medical Association U.S. Pet Ownership and Demographics Sourcebook, they outnumber dogs: 82 million cats vs. 71 million dogs. This entry was posted in Cat Health Month on January 30, 2009 by yourfriends. Finally, an airline for the discriminating canine traveler takes off. That’s right. Those stuffy cargo days are over for the 76 million jet set pets each year; pets of all sizes are now welcome in the main cabin. The first scheduled airline designed exclusively for pet passengers, Pet Airways (PAWS) welcomes pets aboard its specially equipped cabins by Spring-Summer 2009. A huge relief for pet people everywhere, the introduction of this much-needed airline will help reduce the number of pets injured, lost (and worse) on airlines, and our big dogs now have alternatives. Currently, any pet too big to sleep under the cabin seat must be shipped as cargo (and are likely treated accordingly). And pet cargo travel is not even available when outside temperatures are below 45 or above 85 degrees. Just imagine – bright, climate-controlled, pressurized cabins staffed by trained pet attendants every step of the way. Potty breaks and fresh food and water at scheduled stops, medications administered for pups that need them, it’s finally here. Your furry “pawsenger” will lounge on board Pet Airways FAA regulated fleet of twenty Falcon 20, Convair 580 and 5800 and B-727-100 aircraft. Initial routes are scheduled from New York to Los Angeles with stops in Washington DC, Chicago and Denver into smaller, less crowded airports for faster boarding. All this for fares starting as low as $150 per pet, based on size and distance traveled. You can even enroll your dog in the Pet Airways MyPAWS Club for discounts on pet-friendly hotels, pet insurance, medications and even supplies at the PetAirways online store. Become a Platnuim MyPAWS Club member before the end of January for $49.99 and get a free Pet Airways Flight. This entry was posted in airlines, travel on January 27, 2009 by yourfriends. 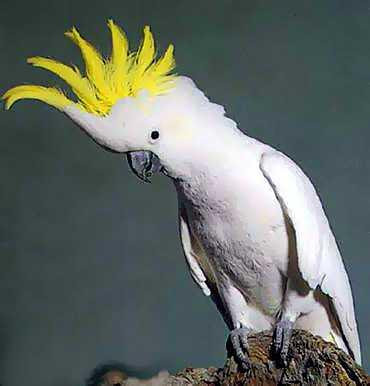 TRENTON, New Jersey – Cries for help inside a house in New Jersey turned out to be nothing but a talkative cockatoo. Neighbors called police Wednesday morning after hearing what they believed was a woman’s persistent cry of “Help me! Help me!” coming from a house. Officers arrived and when no one answered the door, they kicked it in to make a rescue, The Times newspaper reported. But instead of a damsel in distress, officers found a caged bird with a convincing call. It was not the first time the 10-year-old bird named Luna said something that brought authorities to the home of owner Evelyn DeLeon. About seven years ago, the bird cried like a baby for hours, leading to reports of a possible abandoned baby and a visit to the home by state child welfare workers. But it was only Luna practicing a newfound sound, DeLeon told the newspaper. DeLeon says her bird learns much of her ever-growing vocabulary from watching television, in both English and Spanish. This entry was posted in Cockatoo, police call on January 24, 2009 by yourfriends. A dog-owner risked his life by plunging into a frozen lake to save his pet. Walkers were stunned to see the man dive into the water, despite repeated warnings for him not to. He had been shouting at his black cocker spaniel ‘Jarvis’ to come back to the shore after it ran onto the ice chasing ducks. 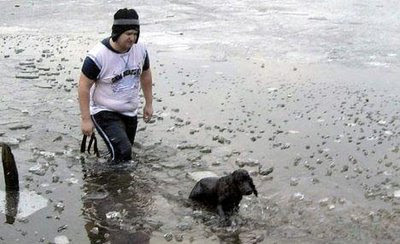 The dog became trapped in water which had not frozen over in the center of the lake. After five minutes of frantic doggy paddling, the dog was struggling to keep his head above the surface and was not able to climb back on to the ice. His owner quickly removed some of his clothes, despite the sub-zero temperatures, and stepped off the bank, smashing the ice as he went neck-deep into water. Both emerged shivering from the cold but the owner simply shook himself dry and calmly walked away. This entry was posted in Ice, rescue on January 21, 2009 by yourfriends. We love our pets more than ever. They are no longer just a diversion. In fact, they have become like children in the home for many of us. From the stories that Healthypet visitors share with us, it seems that you feel the same way. Pets entertain us, make us laugh, and love us unconditionally. What can we do to show them our thanks? Spend quality time with them by going for a walk, hanging out in the back yard, playing games with their favorite toys, or snuggling with them as you watch TV. Always get them immediate veterinary care if you suspect that something is wrong. If you don’t have a solid relationship with your veterinarian, work on that for the sake of your pet. In this time of managed human health care, your pets often get better, more consistent, individualized care than we do. A respected veterinarian is your greatest ally. Feed them healthy food intended for their consumption, not potato chips, cookies, and other fatty human foods. Protect them from home hazards and from extremes of weather. They cannot protect themselves. Update your pet’s identification tags. Many of us move or change phone numbers but forget to update the tags. Perish the thought, but if your pet gets lost, it’s one of the best tools to ensure a safe return. On that note, fix that fence if it is a problem. And if you have a master escapee in your home, talk to your veterinarian or a noted trainer in your area regarding appropriate, humane behavior modification for your pet. This entry was posted in Uncategorized on January 18, 2009 by yourfriends. 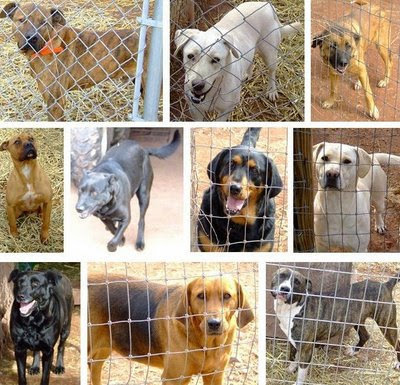 Listed above from left to right: Apache, Butchy, Sheba, Buck, Diamond, Lakota, Xena, Velvet, Cheyenne and Raven. These dogs have been rescued by a lady who can no longer care for them. They are all healthy and well behaved. Their caregiver is overwhelmed and in tremendous financial debt. If you are able to offer any help in any way – through fostering, adopting, or donating money or food — it would be greatly appreciated. For more details or to make a donation, please contact the Animal Welfare League at 301-663-5855. 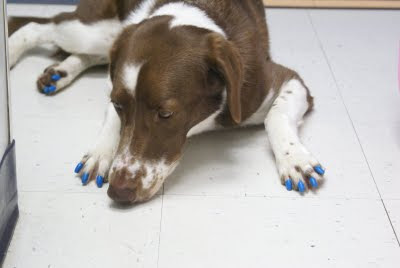 This entry was posted in AWL, rescue, WV dogs on January 15, 2009 by yourfriends. Hi, this is Clover, the world’s most well behaved Beagle. Woof! I wanted to tell you about my exciting adventure. My dad, my sister and I recently participated in our neighborhood Kentlands/Lakekand 5K run. Since my dad and I walk five miles a few times a week, 5K was…What do you say, a piece of cake? Yeah, that. I loved feeling the breeze between my long, floppy ears. I also loved how people admired my speed and athleticism. It was almost as if I was born to be a runner. Don’t I look great with the big red numbers across my chest? I wanted to run as fast as I could and finish in the top ten, but my dad and my sister wanted me to run at their pace. I tried to help them run a little faster by pulling on my leash. My dad did not appreciate that at all. I guess they were getting tired towards the end. I wonder if they were jealous of my energy and four-legged-ness. I will have to ask my sister. It was a historical day for me. 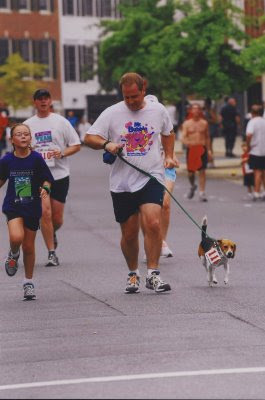 As far as I know, I am the first canine to have participated in my neighborhood 5K run. I can’t wait until next year to do this again. Maybe my mom will join us then. This entry was posted in 5K Run, Clover on January 15, 2009 by yourfriends. A special needs cat seeks a home! Chase, a sweet-natured, 8-month old gray cat, was recently diagnosed with feline leukemia in his bone marrow. Although he tested negative for feline leukemia with the blood test, and thus is probably not shedding the virus, he could at some future stage infect other cats. As a result, Chase needs a home where he is an only cat or lives with other feline leukemia positive cats. Right now, Chase is eating like a horse, plays, is exceptionally loving, and his gums are a healthy pink! Currently, Chase must be confined since he cannot be with my other foster cats. Chase is a beautiful, sweet boy who clearly wants to live! I cannot euthanize him while he is still playing, eating, and full of pep! I will pay for his food and medication (2 pills once a day) for the duration of his life; Chase deserves to have a nice life for whatever time Chase has. If Chase’s anemia returns, there is little that can be done for him. If, on the other hand, he continues to get stronger and becomes less anemic, he may have a chance to enjoy a few years. Right now he is a delight! He plays, he is sweet-natured, and loves to be around other cats and people. I would greatly appreciate any help, advice, or suggestions. Email me at Mary@awlfc.org . This entry was posted in Adoption, AWL on January 14, 2009 by yourfriends. This entry was posted in Uncategorized on January 12, 2009 by yourfriends. Although scientifically described as being modified hairs, each of the roughly 7000 quills on a hedgehog’s back is far more complex than any hair possibly could be. Rather than being solid inside, each is filled throughout with complex network of air chambers. Not only does this make them very lightweight and strong, but it also helps to prevent buckling and breakage. This entry was posted in hedgehog, quills on January 12, 2009 by yourfriends.